I am on record as saying "I love asian food but their desserts just don't do it for me". That was up until recently and I have now discovered a love of Thai desserts. On our recent holiday to Thailand I just couldn't walk past a kanom krok or kanom buang (or any other Thai sweet) vendor without indulging. Other favourites are mango sticky rice and my absolute favourite durian sticky rice. I have cooked durian sticky rice a couple of times and will post about that another time. Using David Thompson's Thai Street Food cookbook I have made a few different Thai desserts including kanom krok, stick rice pikelets and kanom thuay (although not DT for this one) and been pretty happy with the results. Obviously not as good as the street vendors of Bangkok but good enough for us! I remember once ordering kanom thuay from our local Thai restaurant 'Melbourne Thai Cafe" on Victoria Street North Melbourne and thought they were divine. We couldn't believe that they came in a little porcelain cup that you get to keep. It wasn't long and I was searching for a recipe to try and make them at home. After a bit of searching I discovered that they are actually bought frozen in a little packet imported from Thailand! I quickly found these packets for sale in Footscray and we must have gone through at least 10 of them in a matter of weeks. We still have a whole box of the little cups that I now use when making them from scratch. Lately our routine after eating at one of Footscray's many Vietnamese restaurants and buying up ingredients from Little Saigon (another Melbourne wonder) is to head down to Nathan Thai and check out the dessert selection. He also stocks many Thai groceries and of course the frozen kanom thuay packets as well as some other cool Thai products like charcoal BBQ's and bamboo steamers etc. I'm not too sure who makes his Thai desserts or if there are a few different suppliers but he always has a great range of different treats to try. Unfortunately for us, when we dropped in on Saturday after lunch at Tan Thanh Loi he was all sold out! Not to be disheartened I offered to drive to Victoria Street Richmond where I know there are a couple of Thai Video/Grocers that also stock a great range of desserts including our favourite, kanom tokyo. I don't know the names but I think the addresses are 245 and 251 Victoria Street Abbotsford. So after driving along Victoria street we came to Hoddle and discovered that Victoria Street Richmond was closed off for the Vietnamese New Year festival! We definitely kicked ourselves for not knowing about that! We didn't have time (or stomach room) to stop for long as I had a suckling pig to roast so Tina quickly ducked across the road and returned with three different Thai desserts. I will do my best to describe them. the first one is our favourite kanom tokyo, we had these the first time in Bangkok and couldn't stop talking about how good they were. This version is a little different to what we had in Bangkok but no less delicous. They are the pikelet style cake wrapped around a creamy sweet pandanus custard. The green and white layered jelly come in the same pack as the red flower jellies and I don't know what they are. They are made with agar agar which is used in Thailand because it sets at room temperature. I don't mind these and they definitely have a lovely flavour but I'm not so keen on the texture which is different from the jelly I am used to and a bit squeaky on the teeth if that makes sense. The other green one is also a jelly but doesn't use agar agar, I bought these earlier in the week and had one left, I really like these as they are mostly sweetened coconut milk with pandan flavouring. 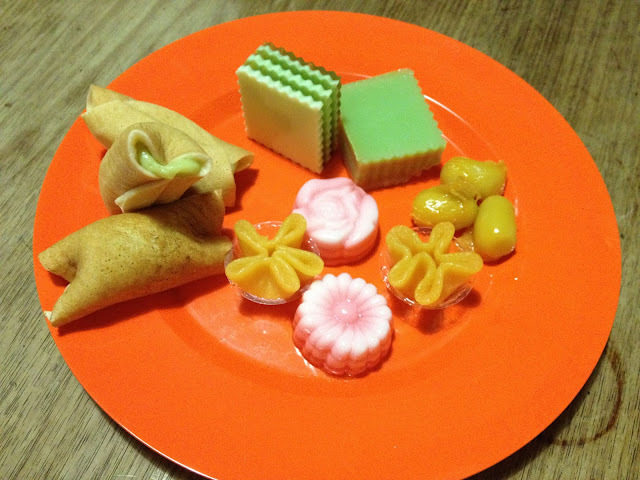 Lastly we have some mung bean egg yolk desserts that I also have no name for. I have a feeling these are similar in ingredients to Thai golden threads but I'm really not sure. They are also a bit of a different flavour and texture but somehow very moorish. From reading the packet I see that they are made by TasKa restaurant in Glen Iris which is not so close to us but probably visit a visit soon. I'm pretty that the Nathan Thai desserts are made by someone different, I vaguely remember the lable had a facebook page where you can order them to be home delivered! Yep, when it comes to sweet things I am generally up for anything. I had three stages in my pregnancy. First trimester - eat healthy and regularly. Second trimester - eat more but still healthy, swim everyday and indulge in sweet treats occasionally. Third trimester - Eat cake, cake and maybe just a bit more cake (with a side serving of chocolate)! So, I think I am fairly qualified to pass judgement on sweet treats. Like hubby, at the beginning of our Thai/Vietnamese adventure I was not really interested in their desserts or sweets. My lifelong training with eating sweets did not include ingredients like coconut and mung beans. How things change...........I can honestly say (and even as I write this I can't believe it) that I am finding these sweets better than any cake I have ever had. They have so much going for them. They are generally small, sometimes colourful, usually made with artistic flair and careful construction and they taste really yummy. I did not immediately like these flavors when I first tried them, but they grow on you and I find myself craving them more then any other sweet treats. My favourite from the pictured treats above is the kanom tokyo (pancake with custard filling) - I mean what's not to like!!! Below is a picture of the first time we had kanom tokyo. We were in Bangkok and came across these at a market and food stall in Silom. These are slightly different in construction to the ones pictures above (not rolled up) but they are the best version of them I have had so far! I was just looking through 'Thai Hawker Food' Kenny Yee and Catherine Gordon - a great book we picked up at a Newsagency in Thailand. I found the name of the egg yolk desserts. The small golden egg drops are called Thong Yip and the Golden egg flower shaped cake is called Thong Yod. Yip and Yod - fairly easy to remember!! According to 'Thai Hawker Food' The Golden egg drops are made from egg yolks and cooked in boiling syrup. The golden egg cakes are boiled in the shape of a tiny pancake and then placed in a small cup (which makes them flower like).......clever! I was back in Richmond the other day and took some photo's of the two Thai stores that sell the lovely Thai desserts. They are both located at the beginning of Victoria Street, Richmond after you cross over Punt Road.